While much of the recent attention has been centered around the Minnesota Twins’ Byron Buxton, who has propelled himself to status as the premier batting prospect in the game after a remarkable 2013 campaign, he will most likely not see much (if any) action at the big league level next season as the Twins appear patient in developing their star outfielder of the future. Despite the production showcased by Buxton this season, the honor of best pure hitting prospect in the game belongs to St. Louis’ Oscar Taveras. Although missing substantial time due to an injured right ankle this year, Taveras has easily proved over the last two seasons that he possesses one of the most polished and big league-ready bats in the minors. Taveras last played in a game on July 15 before being shut down for the season with an injured right ankle, a lingering injury that originated on a hard slide into second on May 12. Taveras underwent season-ending surgery in late-August to remove cartilage and repair ligament damage to the ankle, all of which is expected to successfully heal well in advance of Spring Training. In 46 games with Triple-A Memphis, Taveras put up a solid batting line (BA/OBP/SLG) of .306/.341/.462, a successful transition from last season at Double-A Springfield where he produced a batting line of .321/.380/.572 with 23 home runs and 94 RBI in 124 games. Coming into the 2013 season, Taveras was poised to successfully transition to the Pacific Coast League, which may have led to a more than likely promotion to the big leagues in the second half of the season. While his injury prevented his likely big league debut, such should merely be looked at as a delay. His recovery timeline in accordance with the fact that he possesses the best pure bat in the minors should allow him a chance at the big league roster next season, even out of the gate if all goes well this coming spring. Due to his advanced approach, Taveras is a safe bet to produce for the Cardinals, who may be leaning towards stationing him in center field alongside Allen Craig and Matt Holliday. If the Cardinals desire to place him at center, the likely scenario would be to give him the necessary reps at Memphis at the initial start of the season before the transition over to the roster in St. Louis. Such lofty claims and expectations must be justifiable, as a prospect at such a young age as Taveras is not often projected to excel upon his arrival at the big league level. Luckily for the Cardinals organization, such claims are supported by an impressive scouting report. 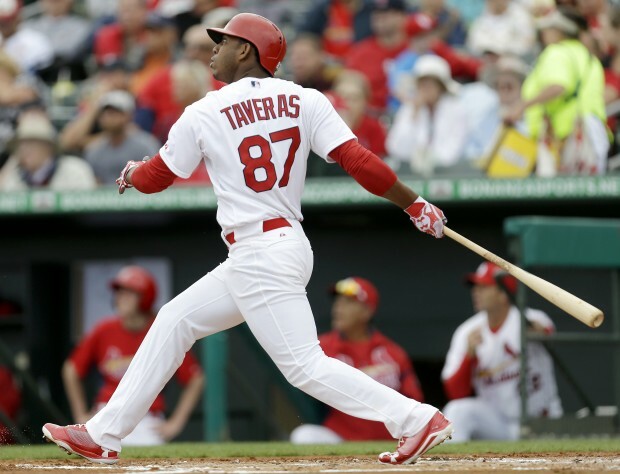 Taveras has tremendous hitting ability. He possesses a rather wide stance and a slight leg kick that allows him to maintain both incredible balance and timing, while also loading his weight on his right (back) leg before connecting with the ball with an explosive, quick swing. He has strong, quick hands and impressive hand-eye coordination that allow him to maintain great control of the bat and make consistent, solid contact with the ball. His power ceiling is high, as he can square up on the ball and drive the ball to all fields with excellent bat speed and a lofty swing. He’s not particularly flashy as a defender, but he runs routes well, reads the ball well, and has solid overall instincts in the corner outfield. Despite his development in the corner, Taveras boasts a strong enough arm and has the potential to excel as an everyday center fielder, which should bode well for St. Louis’ plans in the outfield. As the final days of the regular season rapidly approach, the Cardinals look to capture their first NL Central division title since 2009 and will attempt to make a postseason run at their 12th World Series title. In the backdrop of this all is the much-anticipated arrival of Taveras, who (barring any setbacks from his surgery and assuming that Carlos Beltran does not resign as a free agent) should be given a prime opportunity to get the nod as the outfielder (perhaps, center fielder) of the future in the early going of next season. The future shines bright for the talented young slugger, who, according to his scouting report and premier billing as one of the game’s top prospects, should have a successful first season in the big leagues in 2014.